What is Delta Time (DT)? After reading Karim Chichakly’s recent post on Integration Methods and DT, I was reminded that delta time (DT) has always been a tricky modeling concept for me to grasp. Beginning modelers don’t usually need to think about changing DT since STELLA and iThink set it to a useful default value of 0.25. But once you progress with your modeling skills, you might consider the advantages and risks of playing with DT. The DT setting is found in the Run Specs menu. By definition, system dynamics models run over time and DT controls how frequently calculations are applied each unit of time. Think of it this way, if your model was a movie, then DT would indicate the time interval between still frames in the strip of movie film. 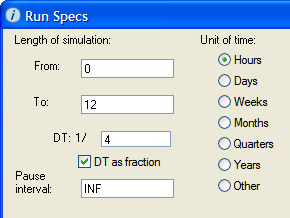 For a simulation over a period of 12 hours, a DT of 1/4 (0.25) would give you a single frame every 15 minutes. Lowering the DT to 1/60 would give a frame every minute. The smaller the DT is, the higher the calculation frequency (1/DT). 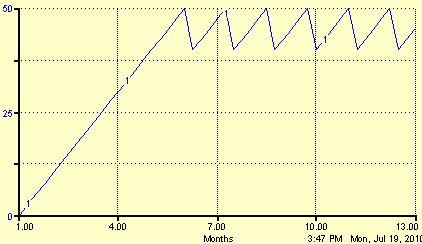 A common tendency for modelers is to set the calculation frequency too high. Without really thinking too hard about it, more data seems to imply a higher quality model – just like more frames in movie film make for smoother motion. If your model calculates more data for every time unit, its behavior will begin to resemble the behavior of a smoothly continuous system. But a higher frequency of calculations can greatly slow down your model’s run performance and more data does not directly translate to a better simulation. Another situation where DT can often lead to unexpected behavior is with models that depend on discrete events. My eyes were opened to this when I attended one of isee’s workshops taught by Corey Peck and Steve Peterson of Lexidyne LLC. I would have expected the value of the stock to plunge to zero after it reached or exceeded 50, but this graph shows the resulting odd saw-tooth pattern. What is happening in the model? In the first DT after the stock’s value reaches exactly 50, the outflow sets itself to 50 in order to remove the contents from the stock. So far so good, but now the DT gotcha begins to occur. Since the outflow works over time, its value is always per time. To get the quantity of material that actually flowed, you must multiply the outflow value (or rate) by how long the material was flowing. When DT is set to 0.25, the material flows 0.25 time units each DT. Hence, the quantity of material removed from the stock is 50*0.25 = 12.50. Suddenly we are in a situation where only 12.50 has been removed from the stock but the stock’s value is now less than 50. 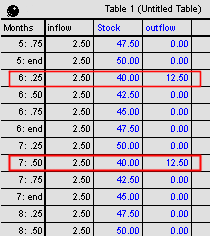 Since the stock is no longer greater than or equal to 50, the outflow sets itself back to 0 and never actually flushes out the full contents of the stock. STELLA and iThink have great help documentation on DT. The general introduction provides a good explanation of how DT works. The more advanced DT Situations Requiring Special Care section focuses more on artifactual delays and the discrete model issues mentioned in this post. Delta time and resulting model behaviors are reminders that system dynamics models run over time, but they achieve this by applying numerous discrete calculations in order to simulate the smooth behavior of actual systems.